The Black Lives Matter movement is a bizarre new phenomenon that doesn’t make a whole lot of sense. Instead of addressing real issues of racism, the activists focus on a few incidents where a black person has gotten into a deadly confrontation with law enforcement — but where there doesn’t appear to have been any racism. In many of the incidents, the officers themselves were black or Hispanic. The high-profile accusations and scrutiny have resulted in ruining the careers and reputations of many law enforcement officers, who are often forced to resign, subsequently facing civil lawsuits and even criminal charges. The activists are getting bolder, most recently interrupting two speeches by far left Democratic presidential candidate Bernie Sanders. Instead of working with him — a fellow radical leftist and strong ally — these activists are shouting him down and not allowing him to speak. The newly radicalized young black activists never had to experience sitting at the back of the bus or segregated drinking fountains, yet they act as if we are living in an era worse than Jim Crow. Just 20 years ago, they weren’t complaining about these incidents. Since there isn’t any more racism now than there was 20 years ago, what happened? Obama has contributed to this racially charged climate. As the first black president, he is evidence that racism has been mostly eradicated in America. But instead of trying to bring the country together, he makes polarizing statements and uses the Department of Justice to aggressively go after crimes he asserts involve racism. Consequently, Americans polled believe racism has increased sharply under Obama. At meetings of the radical left nowadays, attendees are often segregated into “privilege circles.” They are allowed to contribute based on where they are located in the circle. White, straight men are relegated to the very outside perimeter, and told they may speak the least. This kind of radicalization explains why the Black Lives Matter activists feel entitled to interrupt Bernie Sanders whenever they feel like it. Seattle is probably the most progressive major city in the country at this point, but that didn’t matter to the activists. 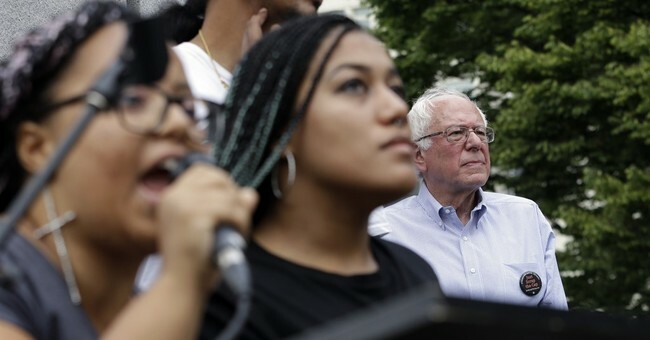 At a rally in Seattle last week where Bernie Sanders was scheduled to speak, activists interrupted and took over the mic, with Marissa Johnson, the founder of BLM Seattle saying, “I was going to tell Bernie how racist Seattle is...” Activist Mara Willaford, who also interrupted Sanders, declared that "white supremacist liberalism" prevails in Seattle. Sanders finally gave up, said “good-bye,” and left the stage. Few have the guts to stand up to the radicals, or risk being called a racist. As an avowed socialist, Sanders is further to the left than virtually every leader in the Democratic Party, yet even he cannot escape being labeled a racist, so he meekly bows out and lets them take over. Instead of accusing law enforcement of racism every time a black person loses their life in an incident, Black Lives Matter should focus on one of the real lingering areas of racism, abortion. More black babies are aborted proportionately than white babies. Planned Parenthood was founded by a eugenicist, Margaret Sanger, who despised minorities. The organization deliberately sets up abortion clinics predominantly in heavily minority areas. Sadly, they won’t, because Black Lives Matter is not really about combating racism. It’s about a left-wing agenda, which needlessly radicalizes blacks in order to get them to vote for Democrats. Stopping abortion is considered an issue only of concern to the right, so the radical left turns a blind eye to the racism there. It is estimated that 684,740 black babies are aborted every year in the U.S. It is unconscionable that a handful of sad deaths involved with law enforcement interactions take center stage nationally by these activists, while the deaths of hundreds of thousands of babies are completely ignored as if they never existed.